Nest programs itself in about a week. turns off the AC a few minutes early, but keeps the fan running. Your AC runs less while your home stays just as cool. for free but is not required to use your Nest. *Not all HVAC systems/smoke detector wiring is created equal. Some systems may require additional labor/materials for successful install: Installations can cost $99-$250 for the first unit and $35-$60 for each additional. Advanced installation for HVAC systems with humidifier/dehumidifiers and/or hybrid units may be additional. Wi-fi is required for app control and to fully utilize all features. Pricing does not include additional time to configure w-fi and/or delays brought on by poor wi-fi connection. Honest Install is not responsible for design for manufacturing defects. 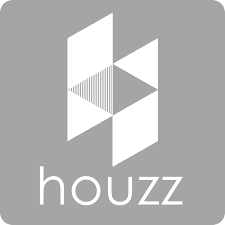 Honest Install is not responsible for problems or issues created by poor or no wi-fi connection to Nest units or communication between Nest units. 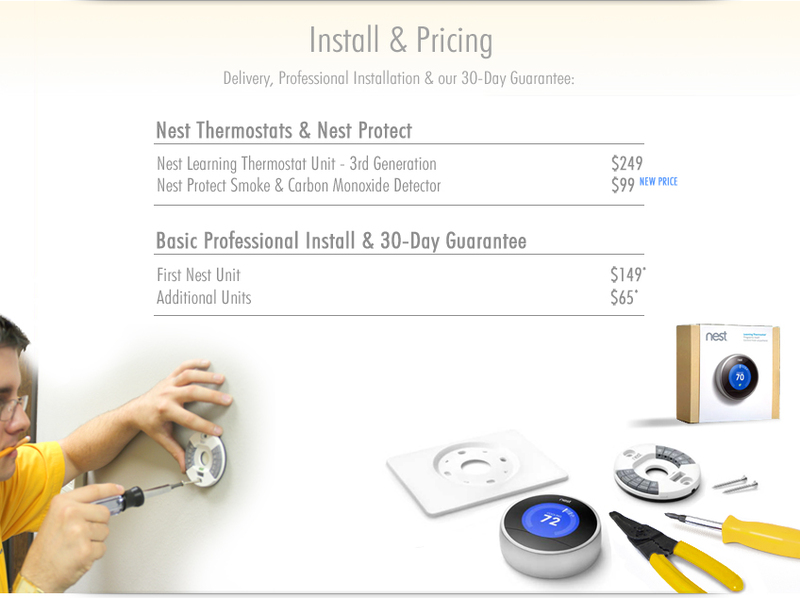 HONEST INSTALL is an authorized Nest product dealer and authorized Nest reseller in addition to being a Nest Certified Professional Installer. As an authorized Nest Learning Thermostat store HONEST INSTALL may officially sell and install Nest Learning Thermostats with the full manufacturer's warranty. The Nest thermostat is currently offered as the second generation or 2nd gen model. Nest Thermostats are in stock and available for immediate installation. 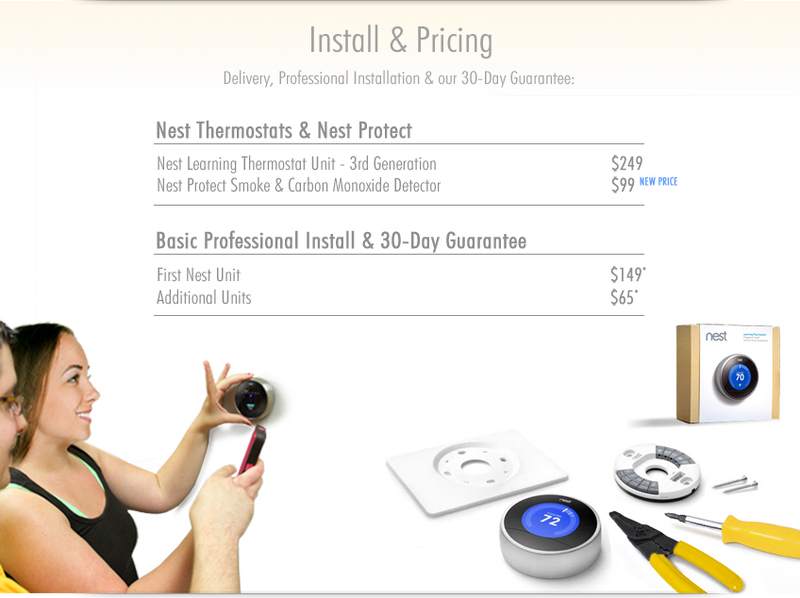 Buy your Nest Thermostat from the experts at HONEST INSTALL. 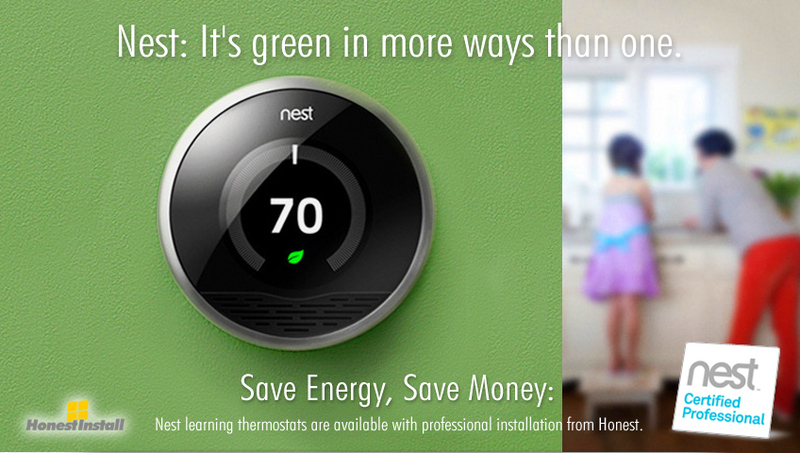 Contact HONEST INSTALL today to purchase, buy and install NEST LEARNING THERMOSTATS: 972-470-3528. HONEST INSTALL is an authorized Nest Protect product dealer and authorized Nest Protect reseller. The Nest Protect - Smart Smoke & Carbon Monoxide Detectors are available for purchase and installation by HONEST INSTALL, a Nest Certified Professional Installer. The Nest protect doubles as a Smart Smoke Alarm or Smart Smoke Detector and is also a Carbon Monoxide Detector or CO Detector sometimes confused with a Carbon Dioxide Detector. As an authorized Nest Protect store HONEST INSTALL may officially sell and install Nest Protects with full manufacturer's warranty. The Nest Protect is currently offered in a wired or battery version and are available in black or white. Nest Protects: Nest Fire Alarms, Nest Smoke Detectors & Nest Carbon Monoxide Detectors are in stock and available for immediate installation. Buy your Nest Protect Smoke Detector and Nest Protect Carbon Monoxide Detectors from the experts at HONEST INSTALL. Contact HONEST INSTALL today to purchase, buy and install the NEST PROTECT: 972-470-3528.